As this is my first blog entry for New Media Campaigns, I think I should probably clarify who's talking. I'm the new guy. No one likes being the new guy at work. There's lingo you don't know, jokes you don't get (because they use that lingo), and that one guy whose name you just can't remember. Luckily, NMC is a small web design firm and there were only six names to memorize, so with the help of some flashcards, Facebook and two hours a day in the library, I got that down within the first week. Since then, I've been working on the lingo part. When I first got here, I felt like that study abroad student who goes to Spain with three years of high school Spanish and thinks he won't sound like an American tourist. Apparently, reading Seth Godin's blog every morning won't teach you everything. As I looked over their shoulders and saw Josh writing CSS and Joel navigating through Photoshop with keyboard shortcuts longer and more complicated than a Vista commercial, I thought I might be in over my head. When I started on my first assignment though, I found that updating and writing content for NMC was surprisingly simple. Before NMC, I'd never created or written for a website outside of blogspot so naturally, I was a little hesitant about jumping in and writing something that actually matters. I had all kinds of preconceived notions involving complicated code and navigational nightmares. 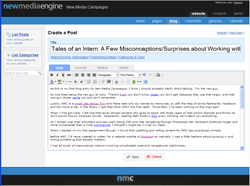 Then, I logged into NMC's Content Management Software and was blown away by its intuitivity (I don't think that's a word but it sounds good, doesn't it?). I went home last weekend for Thanksgiving. This year the whole family came to our house. For me, it's my uncle. He's a bit of a hermit (He just discovered 'Google' two months ago and since then, he's been going to the public library weekly to explore the Internet). So it's always interesting talking to him during the holidays and hearing about his new 'discoveries'. His latest was YouTube. He couldn't wait to tell me about all the cool/funny things he's seen. After describing a few sightings, he informed me, "The only annoying thing was sometimes, these other websites kept popping up. Is that what 'pop-ups' are?" I had to suppress a laugh and inform him that, "Yes Uncle, those are pop-ups." Back at work though, while working with NMC's Content Management Software, I found myself asking the other guys questions that would rival my uncle's in common sense. "How do you add a new page?" I'd ask. Then Joel would calmly point to the very obvious Create a Page link on the left margin of the page. After two or three of those, I learned to just trust the software and try whatever seems most logical. Who would have guessed, it hasn't failed me yet. I was excited to learn that the clients use the same software that I was using to edit the NMC page. I'd read all over NMC's website about how easy-to-use their stuff was but it wasn't until I gave it a shot myself that I really believed it. Anybody else out there who was also pleasantly surprised to realize that their company's products are actually as simple/cool/good as they say it is?